Big excitement - we have LEFT THE ABACOS. In these past few days, as we prepared to leave my mom's backyard for the Last Time (for this season, at least), we became more and more excited about being on our way to Someplace Else. We have been in the Abacos for just over three months now, and we find that we have become a bit settled. There is much to be said for this sense of place. We swing into familiar harbors with the greatest of ease. We know what time Standard Hardware closes in Marsh Harbour and how early they start serving Grabbers at Guana. We have become accustomed to sailing in shallow waters and checking expiration dates in grocery stores. We say "TC" instead of "Treasure Cay" and "Marsh" for "Marsh Harbour." We roll our eyes when we hear boaters on the VHF say "Kay" when they mean "Cay," which is pronounced "key." More eye rolling at the newbies who call for "Salt Spray Marina" (when they mean "Sea Spray Marina") or "Green Turtle Cay Club" (actually just "Green Turtle Club"), or who try to hail fuel docks that we know are not open, or who put out a call for "Man-O-War Harbour" because they want a mooring buoy (who specifically do they expect to reply?). Yes it's true, we are starting to feel like "insiders." In our TC 'hood we know we can count on Cramston Simonette to solve our cell phone problems, Rosie and Jenson to rent us a car, Nikia to be behind the counter at the convenience store, and Florence to make The Best Coconut Bread. Neal is the water guy. My mom (along with most second-homeowners) pays Neal to refill her one-gallon bottles with "purified" water. Neal can carry eight gallons from his store to the golf cart in a single trip: eight full jugs by their handles, four in each hand. We've also learned to count on Greg Cash to help my mom keep the house standing, Trevor (one of Florence's sons) to be enterprising (he's the one who finally removed the pilings that prevented us from docking in mom's backyard), and Johnson to be the finest entrepreneurial teenager in TC. We're gonna miss all these peeps. 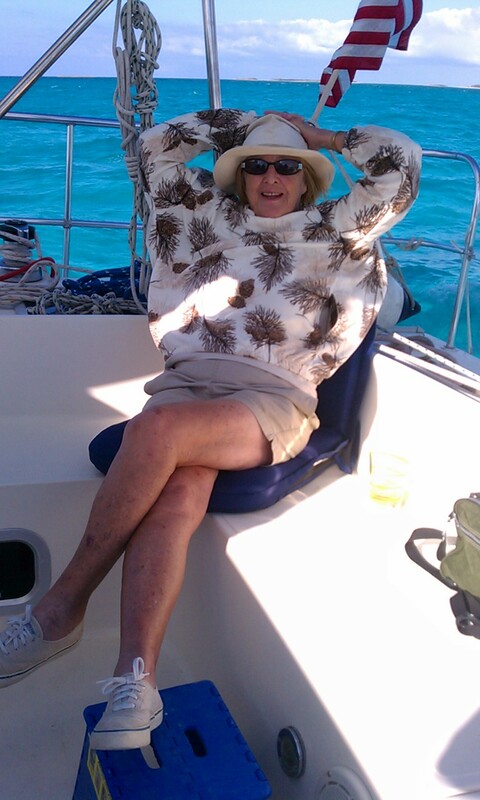 Mom's first sail on Joy. 'Bye, Mom! And yet. We feel compelled to go Someplace Else. Not only because we have to clear out of the hurricane box. Not only because we are looking forward to getting some JOY upgrades in Marathon, FL (energy management, refrigeration, hard bimini). Above all, we're ready to seek out some new adventures. In the Abacos, we've combined mini-adventures with taking care of my mom's house and hanging out with my mom. All well and good, but my mom is a tough and independent old broad, and she will carry on smartly without us. So now, after a rolly, breezy night sail in the Big Water, we are back in the shallows (nine feet as I'm writing this) in the lee of the Berry Islands. We will walk around the settlement at Bullocks Harbour and the Great Harbour Marina, and we won't know where anything is, or who anyone is, or how to get anything done. Nice work if you can get it. More to follow, on our last days in the Abacos and our passage.